by Bob Chapman, 15 Jan 2018. Race 12 of the 2017-18 Season and Heat Three of the Summer Point Score. Conditions for the first race of 2018 were hot, fanned by a gusty westerly wind, with a cool change expected late in the day. Nice to see that David Swales and mates had located the high-pressure water pump and cleaned the slime off the boat ramp – much appreciated. Unfortunately, the king tides earlier in the month had swamped the newly laid lawn adjacent to the seawall and the outcome doesn’t look too good. We had 9 skiffs in the boat park preparing for the day’s race, but Myra Too was short of crew and decided not to race with 2 of their crew making up the numbers on Aberdare. Most skiffs rigged with their smaller or smallest rigs in lieu of the predicted fresh conditions. The race got underway from a handicap start in Athol Bay on the no.5 Westerly course, into a fresh and gusty south-west breeze. 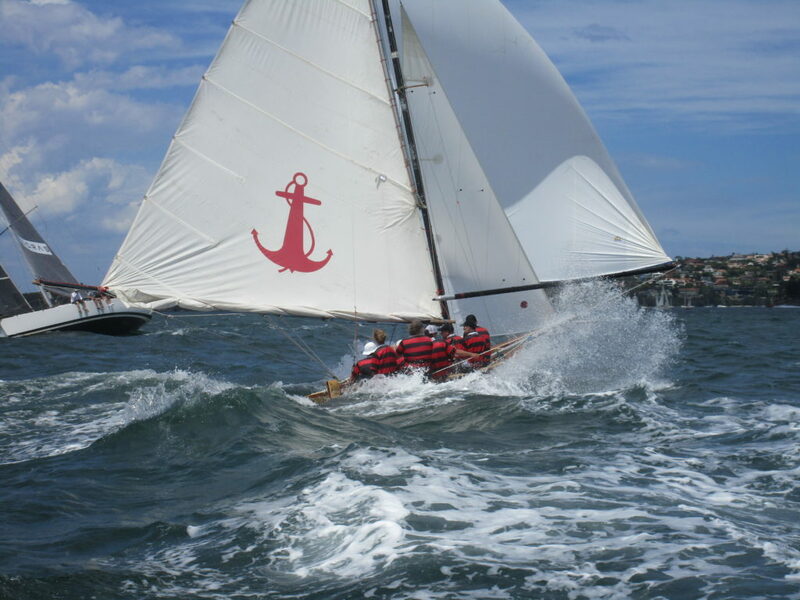 Unfortunately, a number of skiffs were late for their start – a combination of delays due to a low tide for launching and a slow exit from the lee of Careening Cove under small sails. Britannia was ready for their start signal and first away off 14 mins, followed by Alruth (13); Tangalooma (11) was next but missed their start by many minutes; then Aberdare (1 min), with all remaining skiffs late for their respective start – ie the Mistake, Yendys, Scot and Australia IV. Britannia was first to round the Kurraba Point mark for the tight reach to Point Piper, followed by Alruth, then Tangalooma, Aberdare, The Mistake, Yendys, Scot and Australia IV. With little harbour traffic to negotiate the skiffs enjoyed great sailing conditions apart from dodging the occasional yacht demonstrating when/how not to attempt to carry a spinnaker. 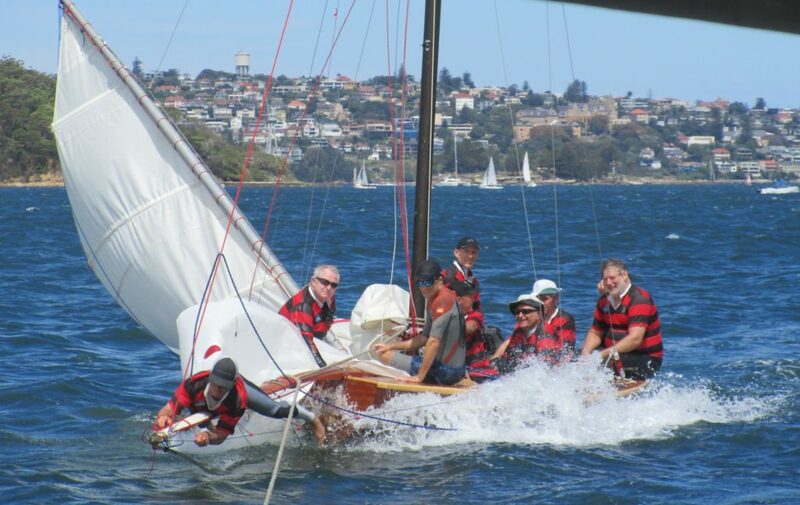 Yendys had an issue with their rudder gudgeon on this run and were forced to retire and accept a tow back to the club. 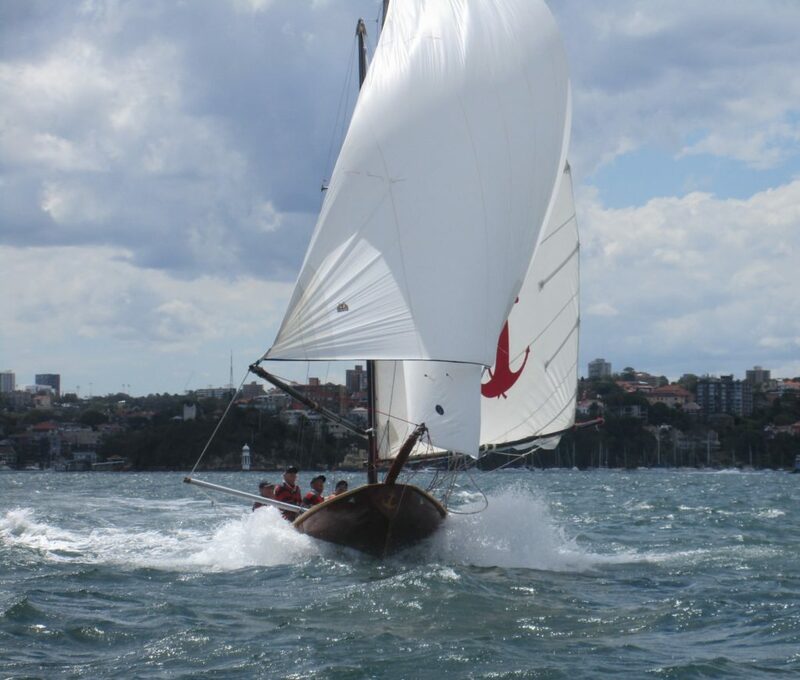 Britannia turned first at Point Piper for the return leg back to Kurraba Pt., a direct course with cracked sheets. 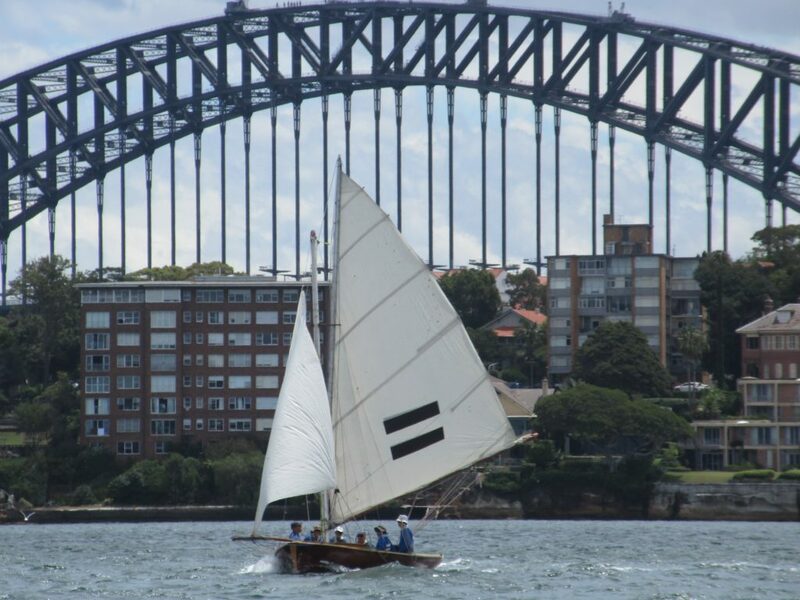 However, as the skiffs approached the northern side of the harbour the breeze moved to the right making the final approach to the mark very tight. Britannia dropped below the lay-line and had to put in a tack to make the mark, while Alruth made the mark in one leg to turn in front of Britannia for the next leg to Clark Island. Alruth led the way for yet another main/jib reach to Clark Island followed by Britannia, Aberdare, Tangalooma, the Mistake, Scot and Australia IV. As the skiffs approached Clark Island there was plenty of wind to keep the crews busy, with some skiffs electing to do a round turn rather than gybe at the island for the final leg back to the finish at Kurraba Point. Alruth continued to lead for the final leg to the finish and take the gun from Britannia, then Aberdare, The Mistake, Tangalooma, Scot and Australia IV. It was a very quick race on a short course, so a timely delay in the start sequence under the ‘AP’ may have been a useful consideration. With thanks to our on-water support team of Russell, Roy, Peter, Adrienne, Barley, Chuck, Bill, Janis and Bill, post-race support from Ross, Coral, Angove Wines and the rest of our tireless volunteers, along with the dedicated team at Rosman Ferries. We look forward to seeing you down at the Squaddie next week.